What it is: Have you noticed how all the fun brain game websites and apps tend to include an older cartoon professor in a lab coat on their sites? 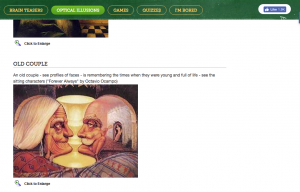 Well, this is another one of those, but it’s forgivable because the site has some fun brain teasers, games, puzzles and optical illusions. If you look at the top of the page once you click on “games,” you’ll see the categories in smaller print: Word, Card, Brain, Matching, Relaxing and Exciting. What I love: My personal favorite are the brain teasers. They’re logical, but not necessarily easy, so they make you think! The optical illusions are also pretty amazing, and they even have some color blind tests. Fair warning: the moving eye illusions can make you a little dizzy! Just for fun, there are also career and personality tests. There’s also a section under Games called “Offline,” which lets you download some of the games as zip files. This lets you play when you don’t have Internet access, which is good if you’re traveling or otherwise out of signal range. What I’d change: The website is a little slow to load, and I’m not a fan of having to watch a video ad before I play, but I suppose that’s how they keep the site free. I could probably do without the jokes, as they’re really something your grandfather would tell to a 7-year-old.